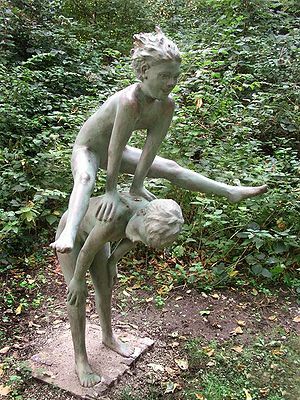 Ever play leap frog as a kid? Scrunching down on the ground, making yourself as small as possible, as your friends jumped over you. Then bursting up and leaping over them? I quickly discovered that leaping big and high was much more fun than being small. When I refused to scrunch down, my friends decided that it was not such a fun game after all. Life is like that – don’t you feel sometimes that you have to take cover and hide, or else your big, bad fears will get the best of you. It is just like a child who hides under a blanket during a thunderstorm, somehow believing she is safe. It really was not the noise that she was hiding from…it was her fear about the noise that drove her under the blanket. Listening to your fears never makes you big – it always reduces you to the smallest common deminator. You lose your power to grow and learn, because fear always immobilizes instead of liberates. When you look behind the fear, you will discover that it was just an illusion, masqarading as reality. “Fear” stands for False Evidence Appearing Real. Look behind your fear to identify the root of the conflict. Then lovingly accept that part of you that feels insecure, anxious, afraid or unsure. Treat it like a child that needs comforting and love. Then decide how you are going to leap frog over your fear and use it to grow to the next level. Leap Frog your life and you will discover very quickly that your fear can be turned into motivation for positive action and growth.